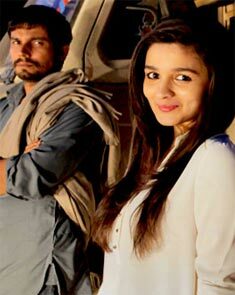 Rediff.com » Movies » Review: An extraordinary Alia on a dream Highway! Review: An extraordinary Alia on a dream Highway! Highway isn’t merely concerned with cataloguing the virginal, versatile landscapes of Northern India. Often it’s the only ray of cheer to offset the grimness concealed within two wounded souls, feels Sukanya Verma. It’s a bird. It’s a plane. It’s Imtiaz Ali. Ever so astir, Ali’s storytelling wears wings as do his creations known to take off impulsively or wander about to unforeseen destinations in a bid to discover, seek, escape or just because. In journey lie stories, a search for sights and self. Be it Socha Na Tha, Jab We Met, Love Aaj Kal or Rockstar, the filmmaker has explored this attribute regularly (and refreshingly) in all his movies. But in his latest venture, Highway, he uses travel like artistry, a narrative form to unfold the adventures of its two leading protagonists learning (and unlearning) a few precious lessons about the capricious course life follows when tackled head-on. Though he doesn’t dwell upon the scenery enough to extract an allegory, there’s both warm familiarity and exotic wonderment to the visual delights he paints before us through Anil Mehta’s majestic cinematography. One seldom acknowledges, forget applaud, the merits of recce after watching a film. Courtesy Ali and Mehta, Highway is a worthy exception. As pleasant it sounds, Highway isn’t merely concerned with cataloguing the virginal, versatile landscapes of Northern India. Often it’s the only ray of cheer to offset the grimness concealed within two wounded souls. They meet under frightening circumstances. Exhausted by the Big Fat Indian Wedding scenario at home Veera (Alia Bhatt), an influential tycoon’s daughter -- few days shy of tying the knot to another dour-faced industrialist type -- sneaks out of her South Delhi kothi for a breather only to land herself in a nightmarish situation. Veera is violently abducted by four frowzy men sporting thick Haryanvi accents. Their leader Mahabir (Randeep Hooda) drags her by the hair through a field in the wee hours and dumps her in the back of his stifling truck. Director Imtiaz Ali captures her horror and suffocation vividly -- Veera sobs bitterly, struggles to free herself in vain. In one throbbing scene, she gets away from a desolate warehouse and feverishly sprints towards any sign of rescue only to realise there is none. Finally, under the gorgeously studded starry sky, she collapses on the vast Sambhar salt plans, cries some more and returns to her unyielding captors. Ali then moves on to the trickiest part of this travel tale -- the shake hand. Even though it’s accompanied by her own sense of disbelief, Veera (too) easily warms up to her situation and instinctively insists there be camaraderie between her and Mahabir/Co. She, like every Imtiaz Ali heroine -- they’re all different versions of the same woman -- is a blend of whim, naivety and verbosity. While the foul-tempered Mahabir is unrelenting and threatens to sell her off in flesh trade, Goru (Durgesh Kumar plays the creepy devil to perfection) is sly and slimy; Tonk (Pradeep Nagar doesn’t get much scope) is indifferent whereas Aadoo (a flawless Saharsh Kumar Shukla) is confused between awe and sympathy. Disregarding class barriers to construct implausible romances is not a novel concept. Highway is a lot bolder in this aspect even if never entirely successful in its realisation. Inner demons are the real obstacles in their path. Fascinating but not enough to overlook the mistiming of Veera’s dark disclosures to Mahabir. The desperation underlining her unusual candour or misplaced humour would seem sadder if there was more evidence to explain her trust in hostile strangers/kidnappers/criminals. Rather Ali, echoing Veera’s sentiments, decides he doesn’t wish to return to reality and moves further towards a dreamier destination. There’s a surreal strength in travel; absolute disconnect from routine makes way for carefree spontaneity. Highway doesn’t elude itself from its virtues and deliberately refrains from depicting the presumed chaos in Veera’s household. The only disadvantage is, in its absence, Ali relies too much on the interaction between Veera and Mahabir, which is uncharacteristically smooth sailing and unconvincingly personal. Delhi, Rajasthan, Haryana, Punjab, Himachal Pradesh or Kashmir, the locations are never spelled out in its 133 minutes running time only implied through culture, climate and clothing. Every state radiates its own charm but Highway hits a pure and meditative mode on arriving in Kashmir’s ethereal Aru Valley. Ali unearths so much soul in these serene settings; he sparsely uses A R Rahman’s rousing soundtrack to dramatize its presence. Except when he does, the upshot is unfailingly effective. As is Alia Bhatt. If Student of the Year launched her as star, Highway brings forth her pluck as an actress. She’s extraordinary here. Given the extent of uncertainty her Veera experiences, she gamely fulfills every challenge, rising above the matter with a sparkling belief in her convictions. There’s a steady resilience about her, which contradicts her dainty daisy demeanour and makes a powerful case of her disturbing admissions. Especially when pointing out the sickening hypocrisy of the so-called elite society. Randeep Hooda’s Mahabir rarely speaks. An enigmatic, aloof albeit tainted figure, he doesn’t articulate his feelings like Alia but studies her with hidden curiosity. There are bitter outbursts though, which hint at a history of socio-economic hierarchy and oppression. Empathetic to the complex notes of Mahabir, Hooda unleashes his ire in the intense 'Kutta Kutte Ki Maut Marega' scene. Comfort not chemistry is what outlines the attraction between Alia and Randeep as they amble along higher altitudes of make believe. Yes, they could be heroes. But just for one day.